Imagine an isolated, sea-girt archipelago, its inaccessible karst cliffs rising above virgin rainforest, surrounded by deserted white sand beaches, turquoise waters and coral reefs teeming with every kind of exotic fish. Overhead a lone sea eagle is silhouetted against the setting sun. It's everybody's dream of a perfect getaway – but fortunately, at Thailand's Tarutao Marine National Park, it's more than just a dream. It's reality. Tarutao is the largest marine preserve not just in Thailand, but in all of Southeast Asia. Founded as Thailand's second marine national park in 1972, it comprises 51 islands in three distinct groups, located in the balmy waters of Thailand's Andaman Sea. To be sure, Thailand has more than its share of gorgeous islands and white sand beaches – enough to fill a guidebook with Robinson Crusoe imagery and desert island clichés. But what makes Tarutao so special is that only one tiny island has a permanent population. 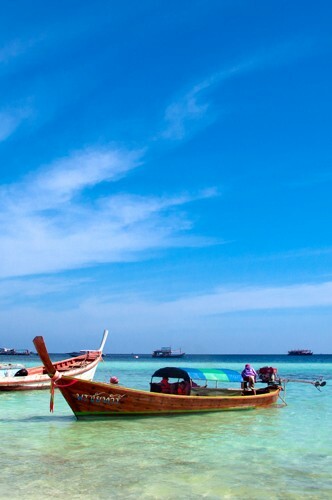 With the exception of tiny Ko Lipe, no private resorts or infrastructure developments are permitted. This regulation is very strictly enforced, and moreover the park is officially closed between May and November when all boat services cease. This makes Tarutao a model of environmentally sound tourism. Great emphasis has been placed by the authorities on preserving the region's natural resources, and consequently the park remains wonderfully pristine and unspoiled. It's the perfect place to get away from it all and relax, no doubt – but Tarutao is also about experiencing the wildness of nature close up. Whether diving coral reefs, exploring sea caves by kayak or hiking to hidden waterfalls, it would be difficult to find a more exquisite and tranquil marine idyll anywhere in the world. The main gateway to Tarutao is the small port of Pak Bara on the Satun coast about a two hour drive from the nearest airports at Hat Yai or Trang. Although little more than a one street fishing harbour, this is the last place the traveller to Tarutao will encounter civilisation in the form of banks, supermarkets or even ATM machines. Then it's onto a speedboat for the 90 minute, 61 kilometre journey to Ko Lipe. After about 15 minutes the boat surges towards Ko Tarutao, a large, isolated island with several fine, white sand beaches and a forest-clad, mountainous interior that conceals year-round waterfalls with freshwater pools for swimming. Visitors like to come here to watch the sunset from Pha To Bu Cliff Rising 60 metres above the azure waters of the Andaman Sea, it offers outstanding views across the archipelago and is celebrated by young lovers as the most romantic place in Tarutao. The park headquarters are located here at Ao Pante Melaka, the landing point for boats from Pak Bara, set beside an emerald creek that penetrates some distance into the island, lined with mangrove swamps and the occasional isolated cove. Ko Tarutao is home to an amazing diversity of plant, bird and mammal species including dusky langurs, crab-eating macaques, sea otters, hornbills, Brahminy kites, dugong and sea turtles – but park rangers aside, the 26 kilometre long island lacks any kind of human habitation. This makes it a wonderful place to visit for nature enthusiasts, who can enjoy trekking in the forested interior or snorkelling, scuba-diving and kayaking along the shore. The coral reefs are world class and home to an amazing 25 per cent of the world's tropical fish species, but accommodation is limited to a handful of park bungalows and carefully regulated camping grounds. At night, under a star-studded sky undimmed by electric light, the silence is palpable, broken only by the waves breaking on the shore and the occasional eerie call of a crab-eating macaque in pursuit of a mate. Beyond Ko Tarutao, some 30 kilometres from the mainland, a tiny archipelago of three small islands makes up Muu Ko Klang or the “Middle Island Group”. These islands are much too tiny to stay on and are best visited as a diving or snorkelling day trip. Perhaps the most beautiful is Ko Khai or Egg Island, which has a crisp, white sandy beach, an unusual natural rock arch known as Lover's Gate, and is favoured by sea turtles for nesting – hence, perhaps, the island's name. Like nearby Ko Klang, or Central Island, the surrounding waters are crystal clear and ideal for swimming. A short distance to the south, Ko Ta Nga is even more isolated, and remains all but unvisited. The tiny archipelago is only accessible by chartered boat from Ao Pante Melaka on Tarutao Island or Ko Lipe in the Ko Adang-Ko Rawi Group, and the sense of isolation in this paradisiacal setting is strong. Scattered in splendid remoteness more than 45 kilometres west of Pak Bara, Tarutao's third archipelago really has a feel of oceanic isolation, the mainland far from sight. Yet, in an apparent anomaly, it is also home to Ko Lipe, the only permanently inhabited island in Ko Tarutao National Park. The island was originally settled by a group of chao leh, or sea gypsies, a nomadic people who spent most of their lives at sea in small boats, fishing, catching seabirds and sometimes diving for pearls. Because of their lifelong association with the sea, they are said to be able to see better beneath the water than ordinary landlubbers. Be this as it may, they rarely ventured ashore except during the dangerous southwest monsoon. With the development of Ko Lipe as a resort island, all this has changed. The chao lae now spend more time on land – or at least near land – than far out at sea, having reached an agreement with the mainlanders who have developed Lipe that they should have effective – and entirely appropriate – control over the business of ferrying visitors to and from the island in small boats called kabang. Friendly but shy folk, they wait for speedboats from Pak Bara to moor at a floating jetty offshore, making a reasonable living in this way during the tourist season, while reverting to a more traditional nomadic lifestyle during the months when the park is closed to visitors. Twice a year, at the full moon of the 6th and 11th lunar months, the chao leh hold a three-day festival during which they build and launch a wooden boat with great ceremony to promote good fishing. The main focus of development on Ko Lipe has been at Hat Pattaya on the island's southern coast, where there are several bungalow-style resorts and a number of very laid-back bars and restaurants. The main activities here are sunbathing, swimming and snorkelling by day, or swinging in a hammock and listening to the soft beating of the waves by night. It's easy to walk across the island's narrow waist to Sunset beach, where fine views of neighboring Ko Adang may be had. There's also a developing beach scene at Sunlight Beach on the east of the island, with similar bungalow-style accommodation and good views overlooking tiny Ko Kra, just offshore. Ko Lipe enjoys an effective monopoly as the only place with fixed accommodation and restaurants in the archipelago, but it should be viewed more as a convenient base for the exploration of nearby islands and dive sites than as a goal in itself. Ko Adang is around 30 square kilometres in area, and is almost completely covered in tropical rainforest. The island is famous for its clear waters, fine quartz beaches and superb coral reefs, the latter providing a habitat for shoals of brightly coloured fish and a host of other marine creatures. Offshore are a number of smaller islands such as Ko Lipe, Ko Dong, Ko Hin Ngam and Ko Yang, making the area a little paradise for swimming, diving, sea-kayaking and sailing. The interior of Ko Adang is quite undeveloped, with several waterfalls cascading down from the central heights. The most notable is Nam Tok Chon Salat, which flows all year round. With an area of approximately 29 square kilometres, Ko Rawi is the second largest island in the Adang-Rawi group. It lies just ten kilometres to the west of Ko Adang and is similarly blessed with fine beaches, a crystal-clear sea, a densely-forested interior and rich offshore coral reefs. Most people visit as a day trip for the swimming, snorkelling and diving, returning to Ko Lipe or Ko Adang in the evening. Ko Yang is a tiny but beautiful island lying more-or-less equidistant between Ko Adang and Ko Rawi. Quite uninhabited, it is the quintessential Robinson Crusoe desert island with absolutely no facilities. It is set like a jewel in warm, aquamarine waters of great clarity, and surrounded by rich coral reefs featuring hard corals such as stag horn coral, leaf coral and brain coral. This makes Ko Yang an ideal and popular snorkelling spot, though because of its isolation both from the mainland and even from nearby Ko Lipe it is never crowded. There is a small and perfect white coral beach for sunbathing. One of the more unusual attractions of Tarutao, Ko Hin Ngam is a tiny, jewel-like outcrop set in the immensity of the Andaman Sea, located about six kilometres northwest of Ko Lipe and about four due west of Ko Adang. Like Ko Yang, it is uninhabited and carries a distinct feel of isolation, but it is beautiful and perfect for snorkelling. The name Ko Hin Ngam means Island of Beautiful Stones in Thai, and it has a small beach covered with smooth black stones in various shapes with distinctive striped patterns. Although these stones would make good souvenirs, visitors should be aware that it is illegal to remove any item found in Thailand's national and marine parks. According to local folklore, Chao Pho Tarutao, the guardian spirit of the archipelago, has also promised that anyone foolhardy enough to carry away any of the island's hin ngam will be cursed and suffer all manner of disasters. Tarutao is truly a paradise for divers, with sites to suit all levels of skill from the beginner to the experienced professional. Dive shops both at Pak Bara and on Ko Lipe know exactly the right time and location to dive according to season, and some of the best coral reefs in Thailand are within the park boundaries. The reefs off Ko Lipe are easily accessible and ideally suited for novice divers or snorkellers, with relatively gentle currents and a plethora of colourful fish just below the surface. Further afield, Hin Takorn Dugong is a more challenging location in deeper water, but with both soft and hard coral aplenty and – as the name suggests – the chance of glimpsing a rare dugong or “sea cow”, gentle beasts that graze on sea grass. The coral reefs at Eight Miles Rock located, as the name suggests, some 13 kilometres south of Ko Lipe deserve special mention. The shallowest part of the reef is about 12 metres beneath the surface and the seabed is over 50 metres down. Swift currents make this dive site unsuitable for beginners, but experienced divers have the chance to see large pelagics such as whale sharks and manta rays. There is also a wealth of soft and hard corals teeming with shoals of tropical fish.